Guys, guys, guys. There’s some seriously delicious, cruelty-free baking going on in and around London, and I’ve wanted to tell you about it for a while. If you’re not a vegan- even if you think vegans are super annoying and if you think vegan food tastes like self-righteous dust, please just read a bit about this 90% vegan London bakery because what they are doing is really interesting and heart-warming in many ways (and they’re also super good value and yummy!) If you do fancy making more vegan changes do check out my article on 10 things I used to make the transition much easier, and 5 reasons why I went vegan even though I LOVED meat. 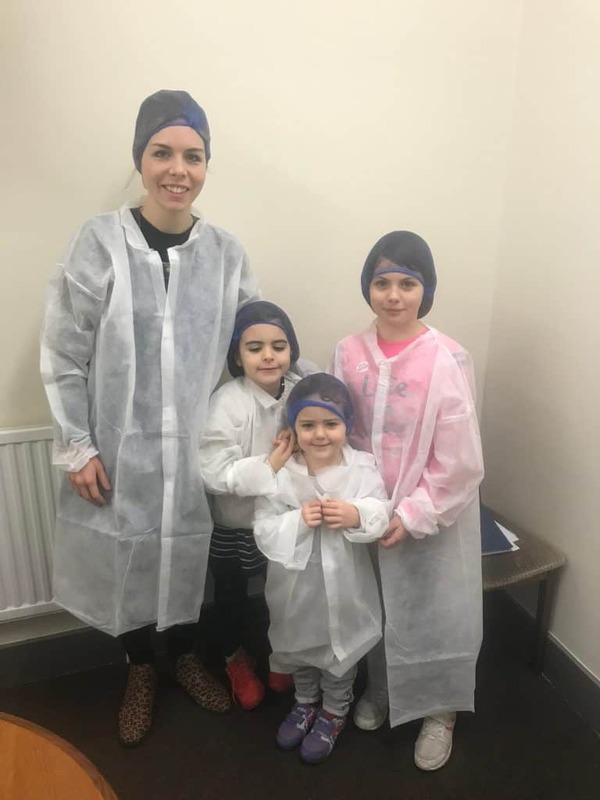 The girls and I got the chance to go behind the scenes of the Coughlans bakery headquarters and had a brilliant homeschool morning learning all about baking and even getting to make some of our own sweet vegan treats (check out the fun at the bottom of this post!) 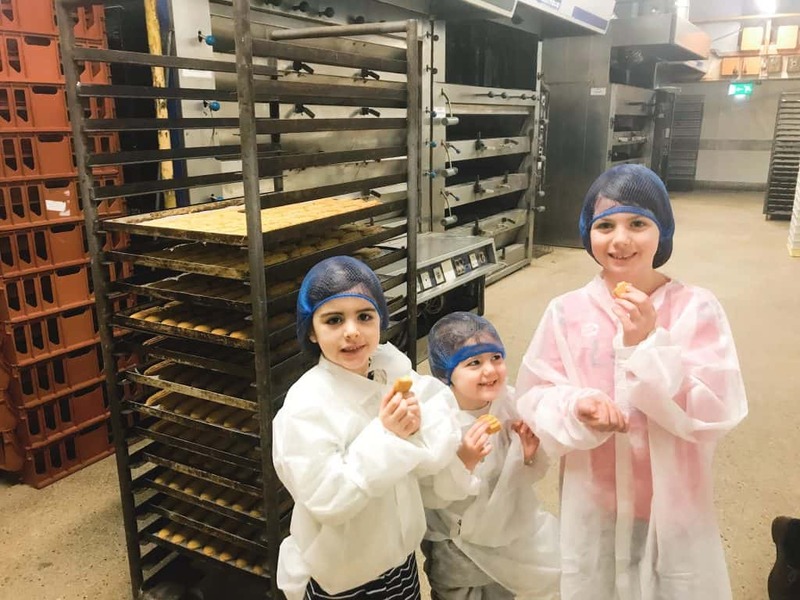 As always I’ll be honest about my relationship with the business I’m talking about- this post is not sponsored, after our family met Sean by chance I asked to do an article on the out of interest and he invited us to the bakery. I’ve lived in south London for 27 of my 29 years, a 5 minute drive from a Coughlans Bakery. I never really took much notice of them until recently until my friend mentioned that they did a good selection of vegan bakery products including Cornish pasties, melty toasties and gooey chocolate cupcakes, at which point I couldn’t get there fast enough. 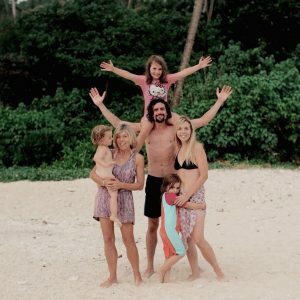 Patrick and I took the kids one weekend and as we walked in I was enthusing (loudly, because how else does one enthuse?) about the vegan bakery selection- there was chocolate dipped shortbread, iced butterfly biscuits and all sorts, and I was in a kind of happy vegan shock that any shop would have so many lush products that I could just walk in and buy without analysing the labels- it just seemed too easy! As we were talking about what to get, a friendly guy started chatting to us and showing us more products. I assumed he was either a really happy customer or a manager- turns out our new friend was Sean Coughlan, one of the third-generation siblings to own and run Coughlan’s bakery (it’s been going since 1937!). 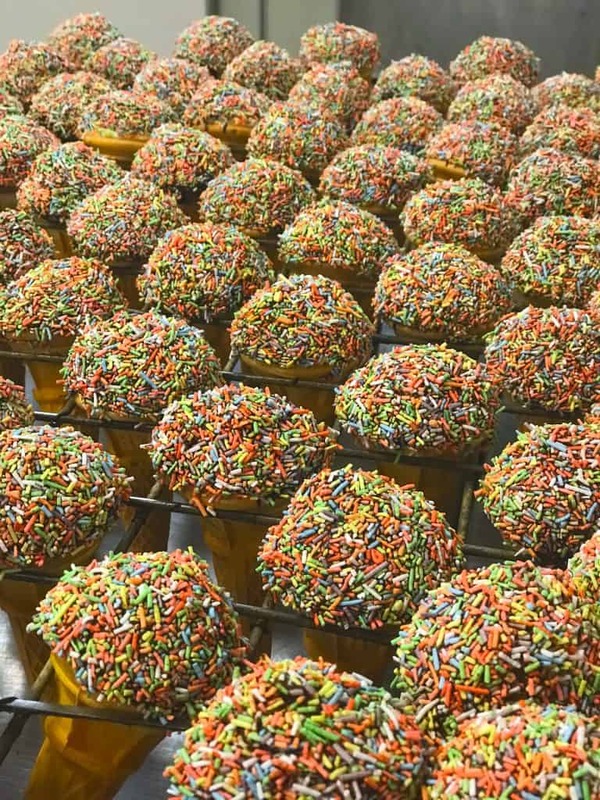 Hand-dipped rainbow cones, a retro treat! Sean and I met up for a chat and to- I was way too happy about this- taste a new range of vegan sausage rolls and toasted sandwiches that he wanted to bring out. I was surprised (and thrilled) to learn that over 90% of Coughlan’s items are vegan, and that once Sean had started looking into how to veganise the products, he found that several of the items were already vegan by coincidence. We tried a warming Marmite, cheese and red onion toastie and the most spectacular vegan sausage roll I’ve ever had. It had the slightly bouncy texture of sausage meat and that traditional delicious salty flavour- it was one of those situations where if I’d bought it on the go, I would have taken it back to check I hadn’t accidentally been given a meat one instead. For Christmas time Coughlans brought out a range including mince pies, the best stollen ever (ever. ever), marzipan petit fours, a thick vegan Yule log and a gorgeous wellington stuffed with vegan sausage meat. It was great to see them at our local Christmas community event with a stall piled high with all these goodies and seeing people buy and enjoy them without even noticing the difference between them and non-vegan options. I asked Sean why he hadn’t done what so many trendy new bakeries do, and really pushed for publicity about the vegan-friendly status of the bakery. His answer was very interesting- that as a traditional family bakery, he wanted people to enjoy all the products without the ‘yuk, no way’ prejudice that often follows vegan food. By putting small vegan labels on the vegan products, the vegan customers looking for them get what they want, and everyone else gets what they’re after- delicious food at a great price, that just happens to be cruelty-free. It’s a kind of vegan ninja approach, and it’s working extremely well. The bakery has reduced its meat use by 90%, which is fantastic all round- for the animals, for health and for the environment! What I particularly liked about Coughlans’ approach was the sense of generosity and community spirit. Many supermarkets throw away spare food, but Coughlans gives away whatever they are allowed to, to local women’s refuge and other charitable projects at the end of each day. 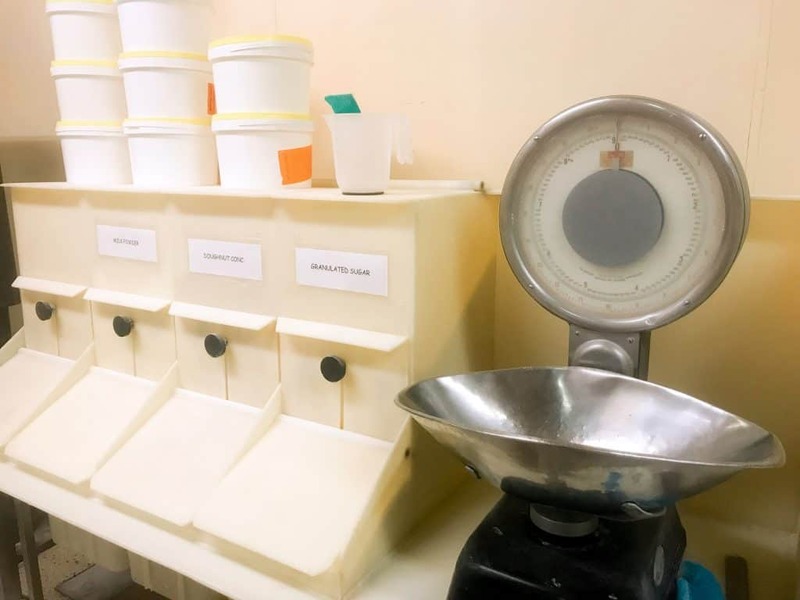 They donate sacks of flour and other items to food projects and have absorbed the (sometimes quite substantial) costs of veganising their items themselves. Apparently it would be cheaper to put gold bars in the rum-soaked stollen instead of vegan marzipan! 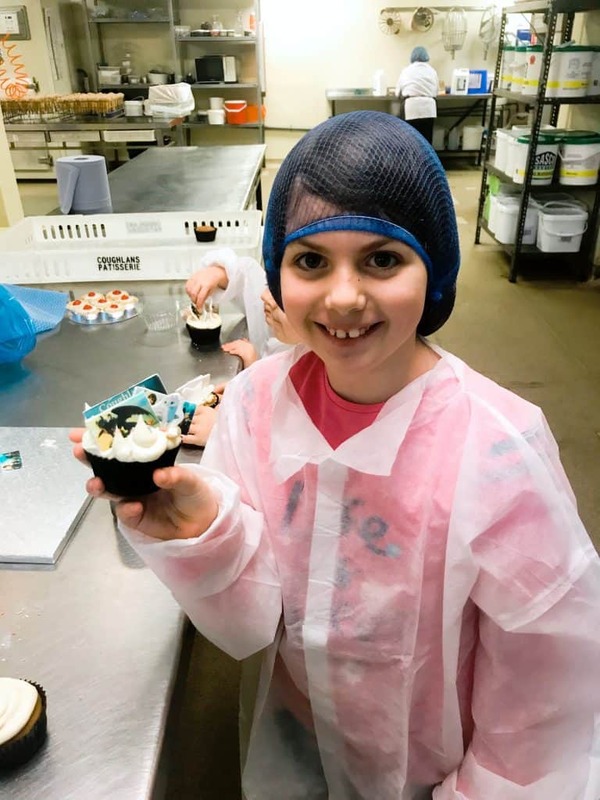 Sean also has a very obvious passion for the bakery, and for feeding people- he has developed several recipes in his own kitchen and is exceptionally hands-on with all the product development, which to me is a fantastic thing for a food business. A few big brands, (not Coughlans) have got vegan food items available in some large supermarkets that I wouldn’t recommend to anyone, vegan or non vegan, simply because the taste and texture is awful (certain sliced ‘meats’ and sausages come to mind). I’m always sad if I find rubbish vegan options on supermarket shelves as I think it gives totally the wrong impression about how easy it can be to eat a vegan diet. Coughlans Bakery, in my opinion, does exactly the opposite. I’ve been there several times recently with the kids, and each time I see tables of happy people munching away on food that they know and love from childhood- those comforting, freshly-baked treats that we all need in winter- and it’s quietly, happily, vegan food. The ultimate test was when I got myself a hot sausage roll (they’re out now, people!) and Eira asked to try it and promptly devoured the whole thing. Coughlans have branches in 22 locations in and around London (find one near you here) which is great- as much as I love little one-off cafes, I also love the familiarity that comes with knowing exactly what you’re getting, and the fact that this chain is authentically family run gives the best of both worlds. Some of the stand-out vegan products at Coughlans for me (yes I may have tried them, in the name of work) are the stollen, the rainbow cake, the Oreo cupcakes, the yum yums (get the butterscotch), the sausage rolls and the Cornish pasties. Sean is often asked to provide cakes for TV programs and the like, and it shows in how professionally the cakes are finished- each one is hand decorated. 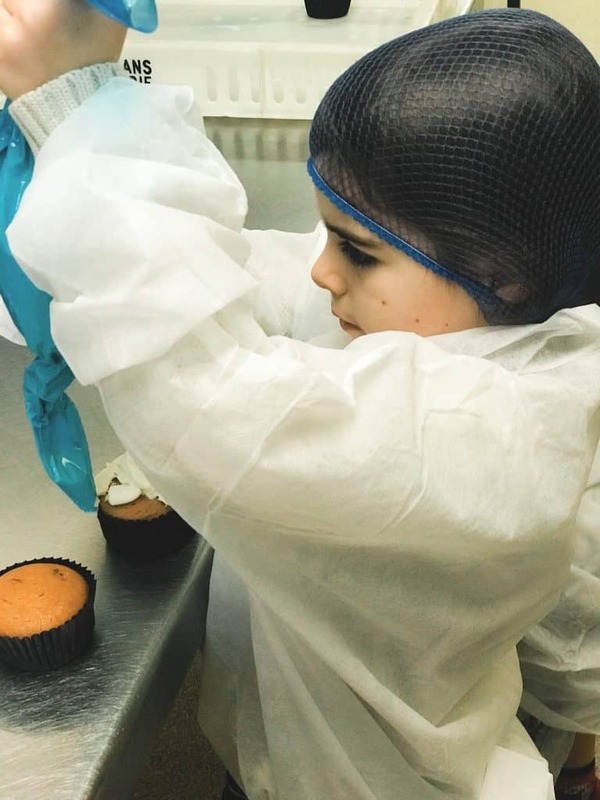 We got to see the hand-decoration in action when the girls and I went to the heart of the operation- the Coughlans bakery headquarters in south London. 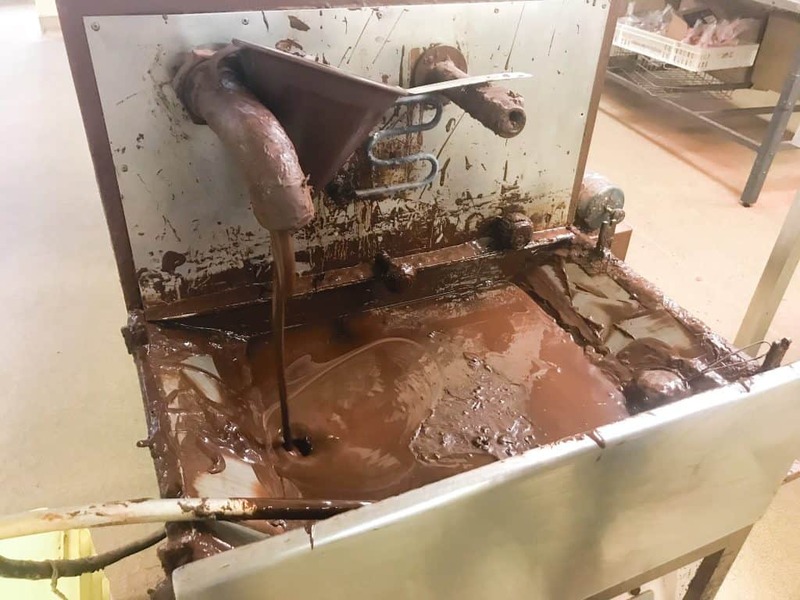 I’ve never been in a ‘proper’ bakery before and I was expecting a huge factory, with long rows of stainless steel tables and endless lines of white-coated workers; kind of like the toothpaste factory that Charlie Bucket’s dad worked at in Charlie and the Chocolate Factory. I was pleasantly surprised to find that Coughlans headquarters was nothing like this- at all. We arrived at 11am to see a fleet of vans leaving with the second run of the day’s products (everything, of course, is baked and sold the same day). 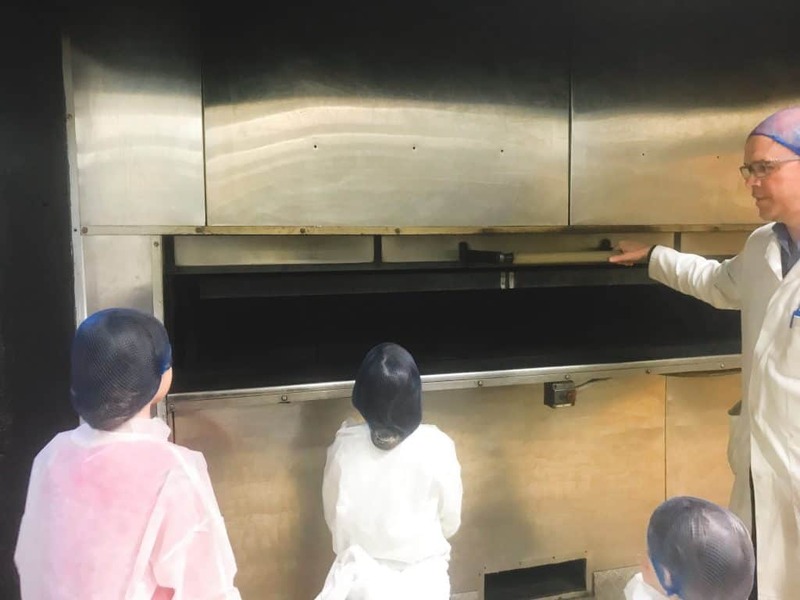 After getting dolled up in some very fetching white coats and hair nets we toured the bakery, which was almost the opposite of what I expected. 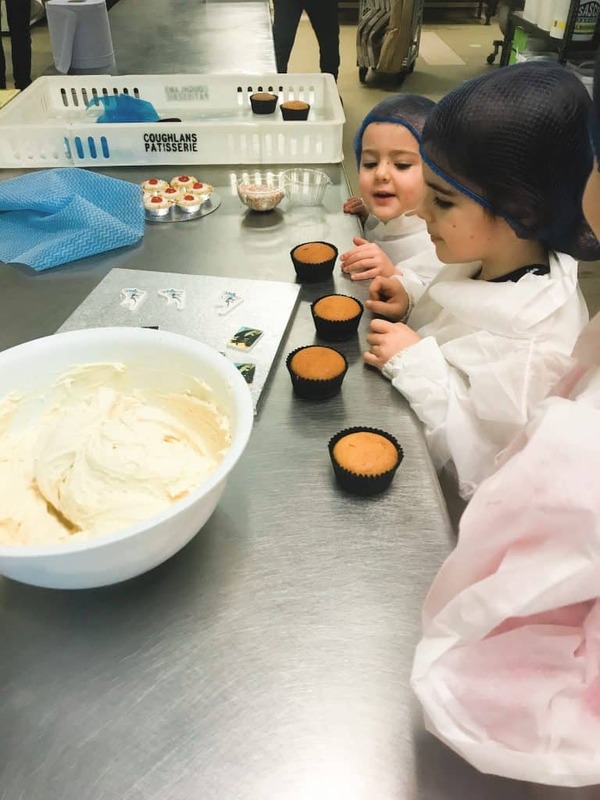 Sean knew the names of all the bakers who were working steadily hand-dipping marshmallow cones in a chocolate bath (hold me back) and carefully piping decorations onto bespoke birthday cakes. Peanuts are not allowed in the factory, but my head sadly took the shape of one. It was great to see Coughlan’s commitment to recycling, up cycling and reducing waste. There was no warehouse stuffed to the brim with products; everything is ordered in batches as and when it’s needed so nothing gets wasted. Even the misshapen bread rolls are made into breadcrumbs to make up the filling for the new (amazing) vegan sausage rolls, and there were several traditional pieces of equipment that you’d expect to see in a 1950’s village bakery, giving the whole thing a proper family-run feel. After our tour we had a real treat- Sean had printed on icing some pictures from How To Train Your Dragon 3, which the girls had seen a few days before. 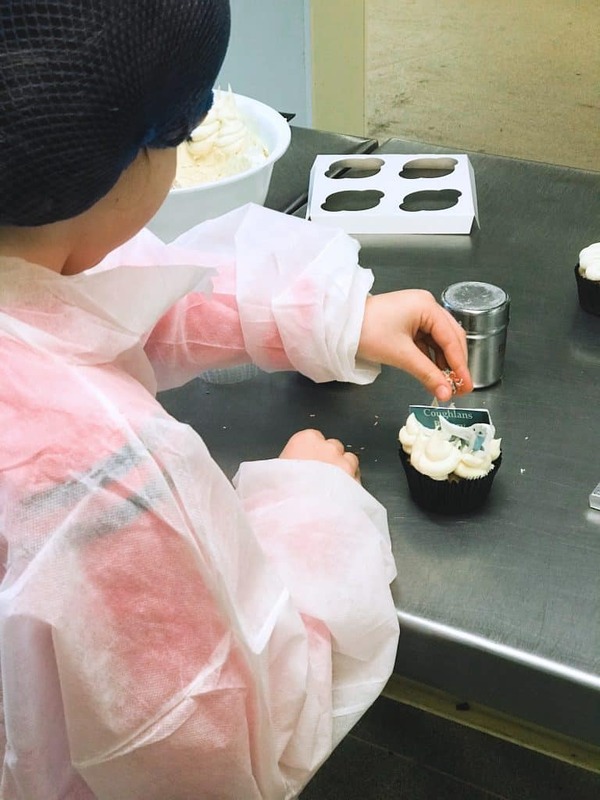 He showed us how to expertly pipe icing onto cupcakes, before patiently watching us mess it up to a hilarious degree. Sprinkles appeared, and edible glitter, and the girls left very happy with boxes of their creations! We also devoured those Bakewells.. The finishing touches… sprinkles, a sugar dragon and the Coughlans logo! It is rare that businesses, especially those with many stores and staff, take such a personal approach to their trade, and discovering the history and ethos behind Coughlans has been a very pleasant surprise. I’d highly recommend visiting a branch and having a taste of the new vegan sausage roll; it is a real game-changer in the vegan world and a delicious first step to environmentally friendly eating! Many thanks to Sean Coughlan and Coughlans for having us to visit; we had a brilliant time and are thrilled that we live so near a branch! Check out this book to try your own delicious vegan treats at home! Vegan Sweets: 50+ Epic Vegan Sweets For Treats & Gifts!